In large bowl, mix all ingredients except rolls and cheese. Cover; refrigerate up to 3 days. To make 1 sandwich, in small microwavable bowl, microwave 2/3 cup meatball mixture, loosely covered, on High about 1 minute or until hot. Fill roll with meatball mixture; sprinkle with about 2 tablespoons cheese. 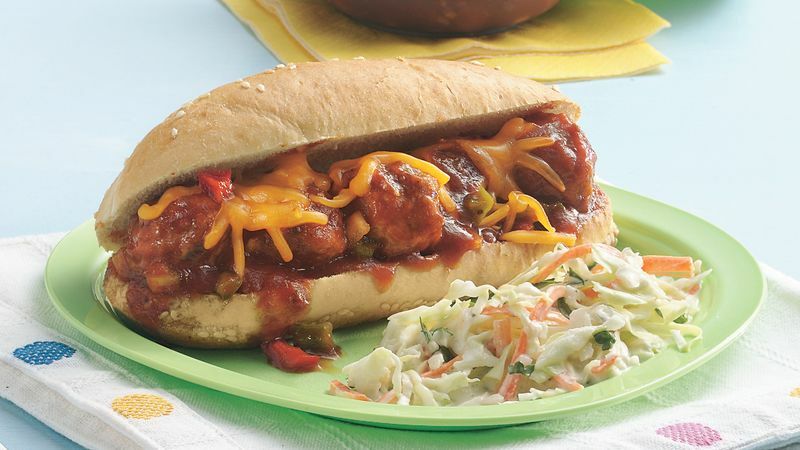 Meatball sandwiches like this one can be a bit messy, so go ahead and use a fork. Then to complete the menu, just add deli coleslaw or a fresh fruit salad.